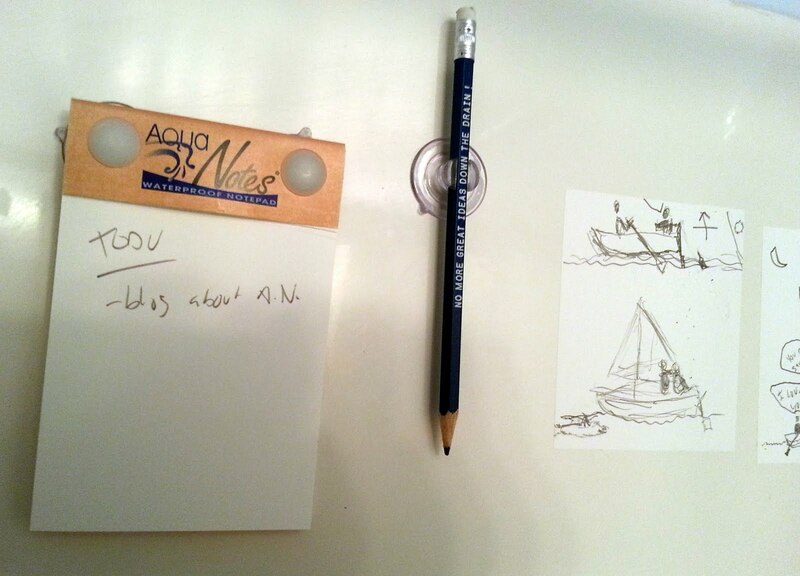 I saw Aqua Notes on Amazon one day, and immediately added it to my wishlist: a note pad that would work in the shower? How awesome is that! Luckily, my brother gifted me Aqua Notes for Chanukah, so I was able to try them out. When I added Aqua Notes to my wishlist I wasn't quite sure what it was all about. Was it a reusable slate or some fancy ink based product? It turns out, the pad is nothing more the a paper note pad, a couple of suction cups and a plain old pencil. You wouldn't think that pencil and paper would make for an effective writing combination while water is pouring down. And you would be wrong. Aqua Notes totally work! The paper gets soaked, but remains strong, and there's absolutely no smudging from the pencil. I'm really amazed at how well the setup works. Aqua Notes turns out to be as useful as I hoped it would be. I can jot down a TODO list, scribble out an idea with ease. More importantly, it let's me leave little notes for Shira to find and respond to. It's all terrifically fun and romantic. I suppose $8.00 for 40 sheets of paper is steep, but given how well the product works I'm sold. And far better than a re-usable tablet, I can rip off the sheet of paper and bring it with me out of the shower. As you can see in the above photo, the notes when damp, naturally stick to the wall of our shower. This makes for an ad hoc pinboard of sorts. The paper peels off from the shower without leaving any a mark. Forget buying some fancy bit of technology to help you kick start your next idea - you just need a notepad and a few really long showers.